As many of you know I love of all things Disney and I also have quite a collection electronic devices. From laptops and tablets to SmartPhones and iPhones, iPads and MP3 players my family is has it all. It's the decadence of this decade that has us fully under it's spell but that's a debate for another day. I also love to give Disney related things away! Today we have a review and DecalGirl Giveaway for you! New Disney Skins and Cases from DecalGirl. I have shopped for skins many times and the quality of the artwork and craftmanship of DecalGirls skins surpasses any I've found. So, when they asked if I'd like to do a review and giveaway of one of the new Disney designs I was over the top excited. 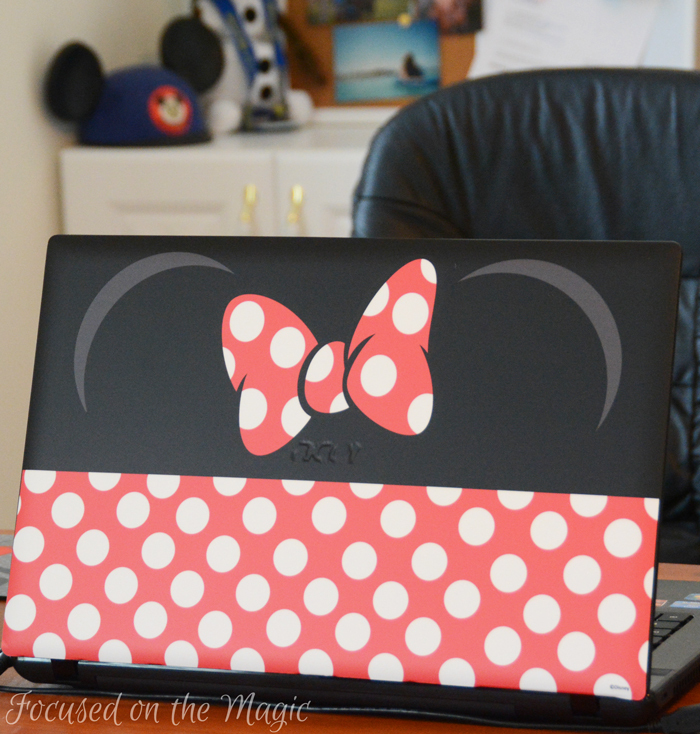 Finally, I would get my plain black Acer laptop Disneyfied! Just in time for my upcoming trip to Disney World! Choosing which Disney artwork wasn't easy though because there are 21 categories of Disney designs with new designs being added daily! 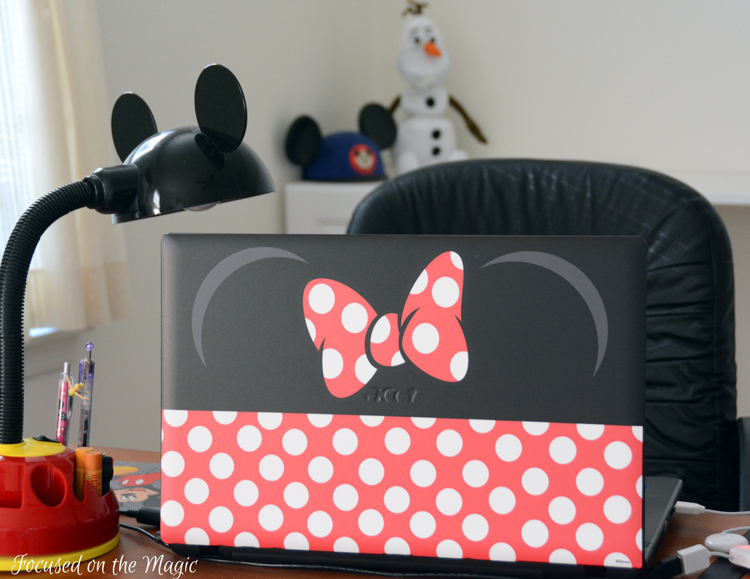 I decided on the "Minnie Bow" skin for my Aspire 17" Acer laptop. Because my laptops cover is not a standard size, I was sent directions to a very helpful video (you can see it here) explaining exactly how to measure and install the skin when it arrived. I chose to have the skin custom cut to size but you can do it yourself. The directions are very easy to follow. DecalGirl customer service has thought of everything! 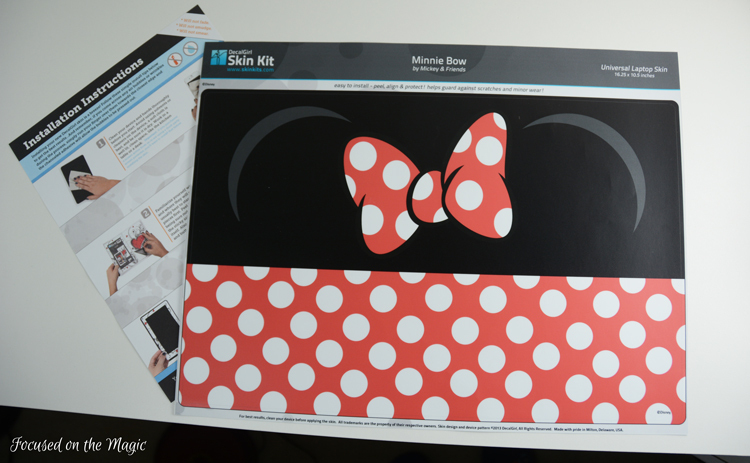 My DecalGirl Minnie Bow skin arrived promptly nicely wrapped in a plastic bag with a cardboard backing. Mine is a matte/satin finish but they are available in glossy as well. I had to clean my laptop with a dry, soft cloth. I used a micro towel. Installation is easy with the clear directions. Just be careful not to stretch the skin or let the sticky side come together. Starting at the top edge of my laptop and using a ruler and DVD cover I laid it down pressing out any air bubbles as I went. It was easy to lift and realign leaving no sticky residue. The whole process was done in 5 minutes. The fit is perfect! I love the way my new DecalGirl skin fits and looks. Minnie is ready for WDW! Kids (and those who are kids at heart) will love choosing their favorite Disney character skins! About: DecalGirl supports over 500 devices and offers over 2500 pieces of artwork. 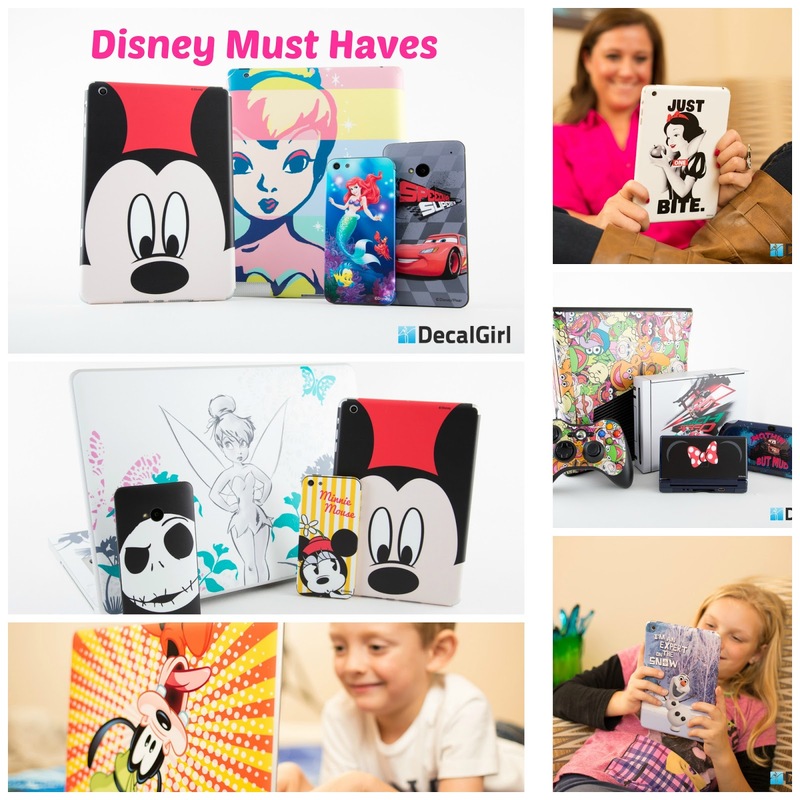 Established in 2003 DecalGirl is the first company to sell licensed Disney die-cut, vinyl skins for personal electronic devices. 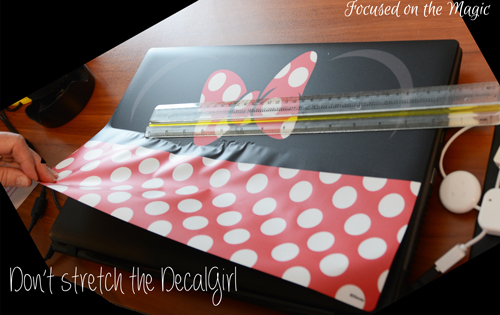 When you sign up for DecalGirl's newsletter you will get a 15% off discount code. This contest has ended. Check back often for more Focused on the Magic contests! 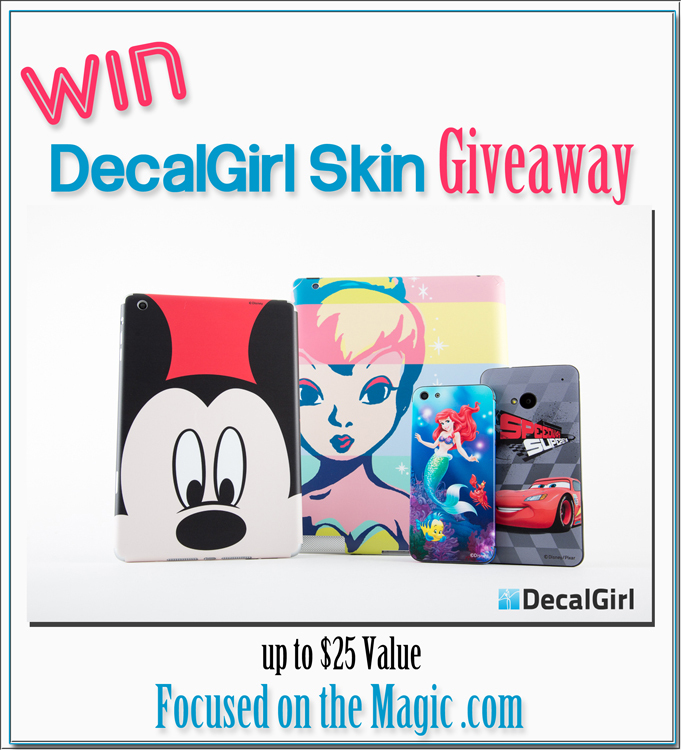 DecalGirl is offering one lucky Focused on the Magic reader their choice of a DecalGirl skin valued up to $25! The giveaway will run from now until 4/25/2014 at 11:59 PM EST. More ways to enter! There are daily entries for more chances to win. To officially accept the prize the winner must reply by email within 24 hours. Make sure that you provide an email address that you check regularly. The lucky winner will be announced on the Focused on the Magic Giveaway page, after the winner has accepted their prize. Entering is easy through the Rafflecopter forms below.